Anthraper Gardens offers you the experience of elegant traditional living in an atmosphere of age old charm. The home is surrounded by water on three sides with a private boatjetty and a sprawling garden. 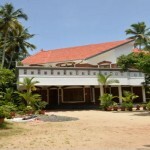 The homestay building is 75 years old, well maintained in a 2 acre plot surrounded by backwaters on three sides. 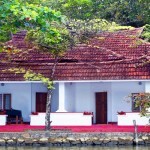 A verandah runs around the building with a view of the backwaters. 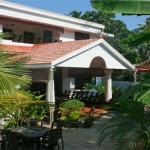 The property is well landscaped with 6000sq ft of lawn, varieties of fruit trees and coconut palms. Anthraper Gardens with waterfront on three sides is a very quiet and picturesque place with a spacious and well manicured garden. Away from the hustle & bustle of the city, it is an idyllic place to unwind and rediscover oneself. 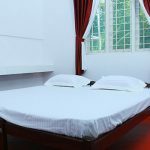 Anthraper Gardens offer two air conditioned suites with twin beds, attached dressing rooms and modern bathrooms with 24 hours hot water facility. Extra bed can be arranged on request. 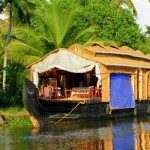 All rooms have a view of the backwaters and decorated in old world style. Vibrant and elegant, with a dramatic view of Vembanad Lake the Anthraper Gardens Home Stay is a vantage point from where you can explore the sights, sounds and experiences around you. 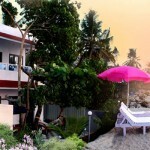 One non-air conditioned room with twin beds, attached bath and private balcony. 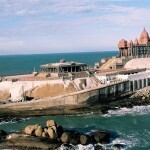 Recreational– Canoe ride, Yoga, Ayurvedic Massage, Beach trips, Cooking demonstrations, Fishing (Fishing pole only, no fishing rods) on requests. 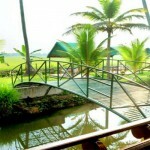 Anthraper Gardens is located in Cherthala in Alleppey Kerala. 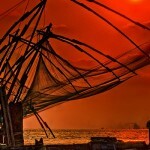 The Cochin airport is just over 60 kms away from Cherthala while the National Highway NH 47 passes right in front. Chethala also has its own railway station.